Launched by a London based Fashion Stylist*, Elkin has become a favourite among Fashion Editors, Models, Musicians and Creatives. We launched our full new collection in mid June 2013 at www.elkinlondon.com so do take a peek! 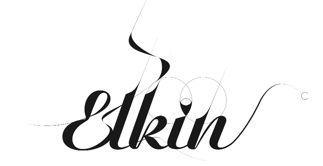 All Elkin jewellery is designed in London. Due to it's handmade nature, each piece is unique and magical. We encourage both men and women to wear our bracelets so styles are available in two sizes. We also encourage international purchases and are especially fond our customers in Italy and the United States who have been most supportive! For press information, sample or image requests please email us at press@elkinlondon.com. For wholesale information for buyers, please email sales@elkinlondon.com. Stylist Eliisa Makin has a ten year career styling for The Independent, The Observer, Guardian and many magazines. Elkin was born after Eliisa created some bracelets in a break between pictures on a fashion shoot. She immediately had to make several more for the fashion team, and has been keeping up with the spiralling demand ever since. The bracelets have been featured by Elle, The Times, Vogue, Grazia among many other publications and future collections inspired by Surrealism, bad rock and pop-culture are now in the pipeline so keep in touch!